Holiday Trails is based on the Isle of Bute, Scotland, just a short hop across the water from the ferry terminal at Wemyss Bay on the North Ayrshire coast. Bute is one of the most accessible of Scotland's islands, and it's this accessibilty, combined with its close proximity to Glasgow, that makes it the perfect location for enjoying the "best of both worlds". Indeed, its location, nestled in the Clyde estuary, means that many islanders are able to commute daily by ferry to their place of work. Although resident numbers have fallen quite dramatically from the mid twentieth century, the development of the internet, and today's digital communications, has once again made Bute an attractive proposition for anyone considering a move. Relatively low property prices, together with the quality of island life, help enhance this appeal. The investment in providing new ferries, and improving the harbour in Rothesay, shows a commitment to maintaining and developing the necessary links with the mainland. 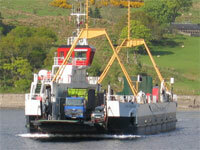 The MV Bute, and MV Argyll run at hourly intervals during the day. The boats have plenty of comfortable seating, and on-board facilities include a coffee-shop which offers food and alchoholic beverages too. The journey from Rothesay to Wemyss Bay is a mere 35 minutes, and a regular train service connects the ferry terminal with Glasgow. Regular buses and taxis also serve the port. At the north end of the island, another ferry makes the shorter crossing, sailing every few minutes, between Rhubodach and Colintraive. Many exploring Scotland take advantage of these two ferry services and use the Isle of Bute as a stepping-stone to the Highlands, whilst at the same time enjoying the experience of exploring the island en route. 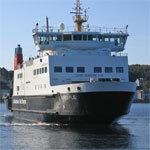 The ferries are run by Calmac, and information on their services, plus timetables, can be found at www.calmac.co.uk. A bus service runs between Rothesay and Dunoon, utilising the Rhubodach to Colintraive ferry, and there is also a service to Kames. Getting to Bute by rail couldn't be easier. 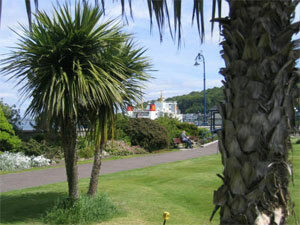 Trains run regularly from Glasgow to Wemyss Bay station, stopping right by the Ferry Terminal. Bute has not one, but TWO international airports on the doorstep - Glasgow and Prestwick. 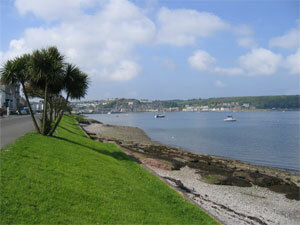 All in all, Bute is a convenient island for the Scottish traveller to visit. It's just a short hop across from the mainland, and, with it being served by regular ferries at the north end of the island too, makes it a logical addition to any Scottish holiday excursion. 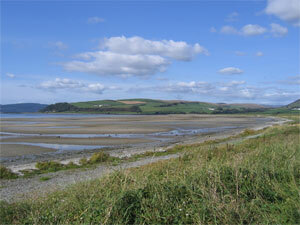 There are plenty of reasons why people should be attracted to the Isle of Bute. The island has a variety of scenic locations, with low lying arable farmland to the south contrasting with high moorland at the northern end. Much of this is due to the Highland boundary fault which dissects Rothesay. The beautiful bays of Rothesay, Port Bannatyne, and Kilchattan Bay attract visiting boats, while the west of the island has sweeping sandy beaches - Ettrick Bay, St Ninian's Bay, and Scalpsie Bay (the latter being the place to get amongst the resident seal colony). Affordable property has long been a feature of Bute, and attracts many to the island, either to live, or for the enjoyment of a second holiday home. Rothesay is the main town of Bute, but there are chaming smaller communities and villages around the island, such as Port Bannatyne, Kilchattan Bay, Straad, Ascog, and Kerrycroy. Traffic is relatively quiet, and overall it's a safe place for families to raise your children. There's a brand new school and college complex at the top of the town in Rothesay which looks after children from nursery age through to secondary education. Argyll College, on the same campus, caters for adult education. 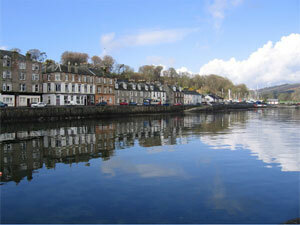 Other schools are also in Rothesay and Port Bannatyne. In the High Street can be found Rothesay's modern Health Centre. A dental practise operates in the town near to the harbour. The island boasts three golf-courses, whose views must rank amongst the most scenic in Scotland. The Stay & Play scheme is perfect for visitors who wish to play on Bute's golf courses. Other sports like Shinty, Football, Curling, Bowls, Horse-riding, Sailing and Kayaking are popular too. 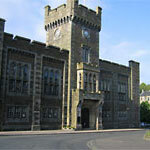 Rothesay Sports Centre has a popular swimming pool and also gym facilities. In Rothesay, there is a small cinema situated to the rear of the Discovery Centre, and the beautiful Pavilion - an art deco building that hosts concerts, and events, is also on the sea front. Other pubs and clubs provide entertainment also. There is much to be recommended about Bute island life. It is particularly suited to those who may hanker for some isolation and solitude, without being too remote! Being able to enjoy the beauty of its surroundings, while at the same time remaining close to modern mainland conveniences, is a situation that few other islands offer. The Isle of Bute has been described as "Britain's best kept secret", and those visiting the island for the first time are often surprised by what they find. It maybe doesn't have the high profile of Arran or Skye, but it has as much to offer the tourist. Indeed, it is not uncommon for locals to hear the phrase from visitors, "Do you live here? You are so lucky!" 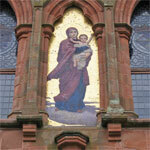 Traditionally, the main industries of Bute have been farming, fishing, fabrics, and tourism. 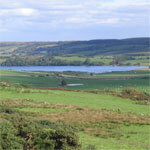 Farming remains important, and Bute is known for the high quality of its beef and lamb. The company, Bute Fabrics is renowned worldwide for the hard-wearing industrial quality material it outputs. Tourism has not been so easy with a rapid decline in visitor numbers since the heyday of Victorian times when Rothesay Bay was filled with visiting steamers "doon the Watter" from Glasgow. The emergence of cheap package-holidays abroad had a lot to do with that, although it was a problem which affected many UK holiday resorts, not just Rothesay. Maybe the recent problems in the package holiday industry, such as high fuel prices and airlines going bump, will see a resurgence in visitor numbers. Many local shops and businesses get by very well, but an influx of new residents and visitors would help the local economy overall. One relatively new industry on the island is the telephone Call-Centre. This is a fine example of a business where location not important. In this digital age, it is industries such as this that will help give employment to local inhabitants. More and more people are working over the internet these days, which allows for freedom of movement. Those that take advantage of this can take "working holidays", and Rothesay hotels and guest houses are usually equipped with broadband facilities. Much in life has changed since the heyday of Victorian times, when the Isle of Bute was a highly popular seaside destination and Rothesay Bay was bustling with numerous steamers and other craft carrying holidaymakers down the Clyde from Glasgow. The island, however, retains its natural charm and beauty, and continues to draw visitors from not just the UK, but further afield, thanks to the international airports close by. 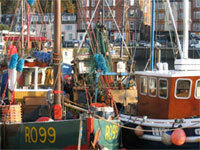 These visitors soon appreciate Bute's laid-back pace of life as well as the friendliness of its inhabitants. 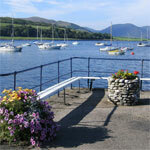 Bute has many hotels and guesthouses ready to cater for those who wish to stay. In Rothesay, the prominent Glenburn Hotel stands sentry over the bay, and accommodates holidaymakers who arrive by the coachload from several popular holiday companies. Smaller, stylish hotels, built by successful businessmen from the Victorian age share attractive seafront situations. Additionally, there are a number of self-catering houses and apartments, and even log cabins and caravans high on Canada Hill, which give breathtaking views of the Clyde, Loch Striven, and the Kyles of Bute. Additionally, there is hotel accommodation to be found at Kingarth, to the south of the island, as well as several other locations around Bute. Others come to explore, walk the "Island Way", horse-ride, go fishing, or maybe take a trip on the Waverley paddle steamer, which visits on most days of the Summer months. The Isle of Bute has an excellent fascility in The Discovery Centre. 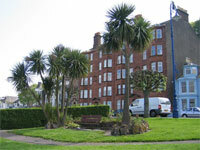 This unique attraction is housed in the ornate Winter Garden on the Rothesay seafront, amidst imaculate putting greens and well-tended flower beds. Plenty of information is available to visitors, not least from the helpful staff, and a permanent exhibition promotes all aspects of the island. There is also a wealth of souvenirs, maps, books and guides available. To the rear of the Discovery Centre is Rothesay's cinema. Mount Stuart is a magnificent Victorian gothic mansion, home to the Stuarts of Bute, which sits in 300 acres of beautiful gardens. It was created by the 3rd Marquess of Bute from the ashes of an earlier house on the site which was destroyed by fire in 1877. The 3rd Marquess of Bute commissioned the celebrated Scottish architect Robert Rowand Anderson to produce the new Mount Stuart, and the building that emerged was remarkable, and far more imposing that its predecessor, more like a palace than a house. Internally, Mount Stuart was built around a vast central hall, with marble pillars, sixty feet square and three storeys high, and while it is impossible to estimate how much the house cost to build, it is clear that it lacked for very little. Mount Stuart was home to the world's first domestic heated indoor swimming pool, and was also the first house in Scotland to be lit by electricity! The sandstone house is inspired by history, astrology, art and mythology, and contains an imposing central hall with marble pillars, sixty feet square and three storeys high, a breathtaking chapel, ornate reception rooms, and the world's first domestic heated indoor swimming pool. 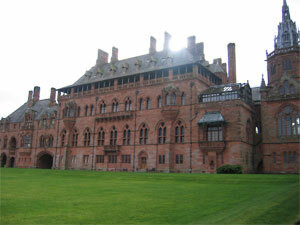 Mount Stuart was also the first house in Scotland to be lit by electricity! While it is impossible to estimate how much the house cost to build, it is clear that it lacked for very little. An ambitious restoration programme was begun by the late 6th Marquess in the 1980s and maintenance and care of the mansion and grounds is an ever ongoing programme. The 2nd Earl of Bute began landscaping the substantial grounds of Mount Stuart, which are amongst Europe's finest, in around 1717. 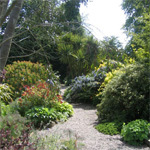 These grounds incorporate vibrant gardens, wilderness and woodland. The award-winning Visitors Centre is a modern building that stands in stark contrast to the Victorian Gothic splendour of the main house. It contains an impressive Restaurant on the upper floor, with frameless glass walls, and a balcony overlooking the picturesque surrounds. 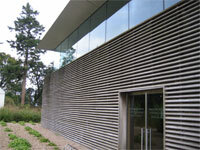 There is also a Gift Shop, acclaimed Art Gallery and auditorium. A Garden Centre is situated alongside. These spectacular gardens are famous for fuchsias, pot plants and its water garden. There is also a popular tearoom. Open May to September. This sunken Victorian fern house built around 1870 has now been fully restored. 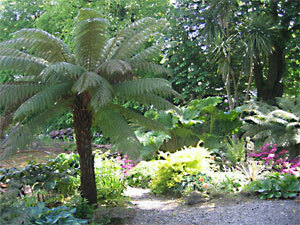 The fernery is a unique and beautiful feature housing 80 sub-tropical fern species. Special features including Clyde steamers, children and toddlers display. Wild flowers, birds, small animals, geology, archaeology and local history. The museum shop stocks an interesting range of souvenirs gifts and books. The Isle of Bute Discovery Centre, opened in 2001, is set in the centre of the splendid Esplanade Gardens, and showcases the many and varied attractions of the island. There is a tourist information desk, and many excursions, hotels etc can be booked here. The cinema has 87 seats with wheelchair access. The shop area stocks a large range of gift items, many produced locally. A beautiful sandy bay which has fine views of Arran and the Kintyre peninsula beyond. There is a popular tea-room offering refreshments to visitors all year round. 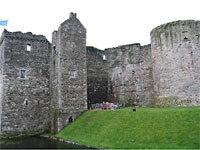 A fine example of a 13th Century castle whose circular design is unique in Scotland. Substantial restoration work has been carried out over the last 120 years. 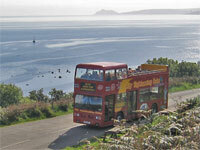 The wide expanse of Scalpsie Bay, with its beautiful backdrop of Arran, is the home of Bute's large seal colony. These creatures don't seem to mind the attention they get from passers-by. St Blane's Chapel is named after St Blane, who was born on the island in the 6th century. It lies about 2 miles south of Kingarth above Dunagoil on the west coast, and near the southern tip of the island. The most impressive surviving Victorian public convenience in Scotland, if not the UK. Still in use, they can be found on Rothesay Harbour.